Sixteen-year-old Jimi knows people change, but nothing could prepare her for what’s about to happen to her best friend, Del. Del is obsessed with becoming a chimera: a person who pays back-alley geneticists, known as “genies,” to illegally splice animal genes into their own. The resulting physical changes have scared lawmakers into drafting legislation declaring chimeras officially nonpersons, so when Del goes missing, Jimi is desperate to find him before he alters himself forever. As she tries to save him, Jimi must face down unscrupulous people and risk her own life, all while knowing that if getting spliced is the choice Del has made, it means he’s leaving her behind forever. Sixteen-year-old Jimi knows people change, but nothing could prepare her for what’s about to happen to her best friend, Del. Del is obsessed with becoming a chimera: a person who pays back-alley geneticists, known as “genies,” to illegally splice animal genes into their own. The resulting physical changes have scared lawmakers into drafting legislation declaring chimeras officially nonpersons, so when Del goes missing, Jimi is desperate to find him before he alters himself forever. As she tries to save him, Jimi must face down unscrupulous people and risk her own life, all while knowing that if getting spliced is the choice Del has made, it means he’s leaving her behind forever. Fun, yet highly informative book. For anyone who seeks out fresh and original sci-fi thrillers, Spliced will definitely fill the bill. Based on the idea of splicing animal genes into humans in order for the human to become a Chimera, becomes the goal of Del, one of the main characters. As the Chimera issue becomes more of an issue, lawmakers attempt to label the Chimeras as nonpersons. When Del goes missing, Liz, his girlfriend, is faced with the threat that he’ll never return as she knew him. As a bonus, the story cleverly arrests the listeners attention with the possible correlation between the Chimera focus and that of our own modern society, including the reminder of multiple discriminations running rampant in our own experience. As read by Sophie Amoss, one is definitely going to find this listen a page turner. 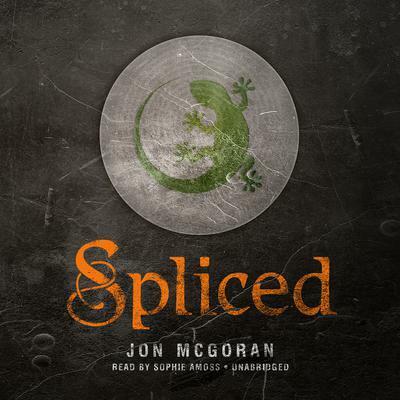 Jon McGoran is the author of Spliced, a near-future YA science fiction thriller that Kirkus calls, “Timely, thrilling, and more than a little scary.” McGoran’s other books include the acclaimed ecological thrillers Drift, Deadout, and Dust Up, as well as The Dead Ring, based on the hit TV show The Blacklist. Writing as D. H. Dublin, he is also the author of the forensic thrillers Body Trace, Blood Poison, and Freezer Burn. When not writing novels and short fiction or cohosting The Liars Club Oddcast, McGoran works as a freelance writer and developmental editor. Learn more at www.JonMcGoran.com.